Bulldogges are not like other dogs. They are intrinsically stubborn. They are loyal to death. They are impervious to pain when in protection or prey catching mode. They are not as easy to train as some breeds but then again, they aren’t as hard to train as others. The ideal bulldogge owner takes this all into account. The ideal bulldogge owner recognizes that stubbornness – the most common and universal trait of all bulldogges – is not a flaw but an attribute. A stubborn dog, once trained, will stubbornly do as he has been trained. Bulldogges are not wimps. They are tough. To them, “impossible” just means something will take longer to accomplish. There is a good reason that the United States Marine Corp uses the bulldog as it’s mascot. They rarely start fights, but if involved in one the bulldogge will never back down. Bulldogges do not need large quantities of exercise. They don’t usually like to swim (in fact, they tend to sink like bricks), and they aren’t good at repetitive things that require a great deal of expended energy like competitive obedience. They prefer the couch to the floor, a nap to a hike, and a good belly rub to a game of fetch. They do like to play tug-o-war. They possess a great sense of humor, are usually great with kids, and are easy to live with once they’ve grown up a little. 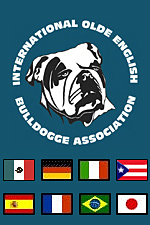 Bulldogges are usually clean and quiet unless truly defending their home or family. The Ideal bulldogge owner should be assertive without being over-bearing. Should have at least some – successful – experience with dogs, and above all else, have a good sense of humor. Living with a bulldogge is a joy. It is an experience you will never forget. You will be endlessly entertained, thoroughly protected and very well loved.